The surface finish you select for your custom granite countertops will affect the look and feel of your living space. How much – or how little – sheen you decide upon will also determine how well the stone’s natural characteristics and color variations come to view. A range of finishes can be applied to custom granite countertops, each of which adds a different dimension to the stone. Visiting a local counter design center is the best way to explore your finish options, but the following guide to the three most popular stone finishes should provide a good starting point. Polished granite countertops have a high-gloss, mirror-like sheen. Many homeowners choose this finish because it allows the full color and character of the natural stone to shine through. Another plus to a polished finish is that it makes for low maintenance counters – the stone is easy to clean and doesn’t require frequent sealing. Furthermore, polished granite stands out as a focal point in a kitchen or bathroom, as the glossy shine contrasts beautifully against the wood cabinetry. Honed granite countertops are satin-smooth, with just a slight sheen. The nearly matte appearance hides scratches and etches more effectively than a polished stone. And, honed counters have a softer, more natural look. However, this finish can dull the granite, obscuring some of the stone’s subtle color variations. Also, with a honed finish, countertops are more susceptible to damage, which means spills must be cleaned up immediately and the surface requires regular sealing. Leathered granite countertops have little to no shine and a natural appearance, like honed counters. However, while the latter finish is smooth, leathered stone has a pebbly, textured surface. The overall effect is rustic, warm and inviting, and homeowners tend to like how the surface hides fingerprints and doesn’t need to be sealed often. That said, leathered granite has pits and fissures that can be difficult to clean. 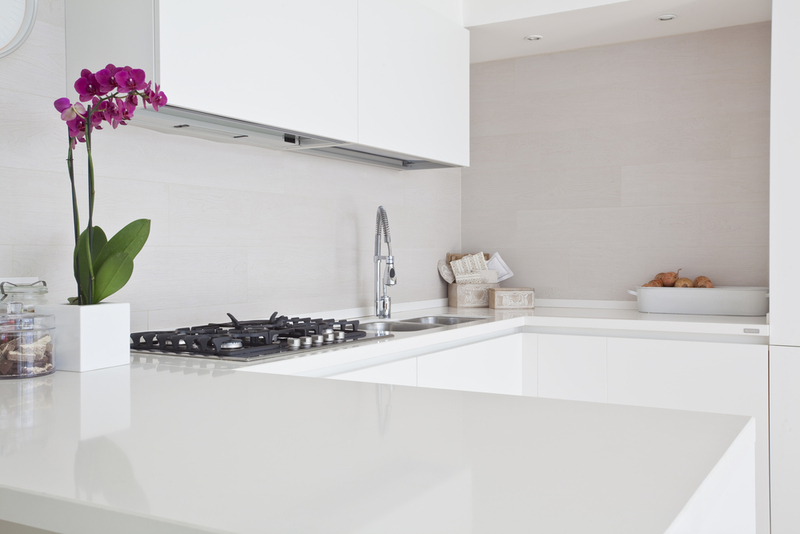 Which Countertop Finish Should You Choose? Every finish option for custom granite countertops has advantages and drawbacks. The decision on which to select boils down to two things – the look you like and the level of daily care and ongoing maintenance you prefer. Really, there are no wrong choices when it comes to countertop finishes. Whether you go with polished, honed or leathered granite – or any other type of surface finish — you’re sure to end up with a beautiful, high-end look. When you’re ready to choose custom granite countertops for your Utah, Idaho or Wyoming home, turn to the award-winning professionals at Creative Granite. Our counter design center stocks an extensive variety of gorgeous granite slabs from around the world, and our expert team can help you decide which type of countertop surface finish best meets your needs and wants. Stop by the Creative Granite design center in Salt Lake City to view our selection in person, or contact us to schedule a no-cost, no-obligation consultation and estimate for custom granite countertops today. This entry was posted in Blog on October 21, 2018 by admin.